The town of Goshen plays an important role in connecting Connecticut residents to their agricultural heritage. One of the ways the town accomplishes this is by hosting agricultural fairs. Through both local fairs, as well as its past association with the statewide Connecticut Agricultural Fair, the fairgrounds in Goshen boast one of the most impressive records of agricultural fun and education in the state. 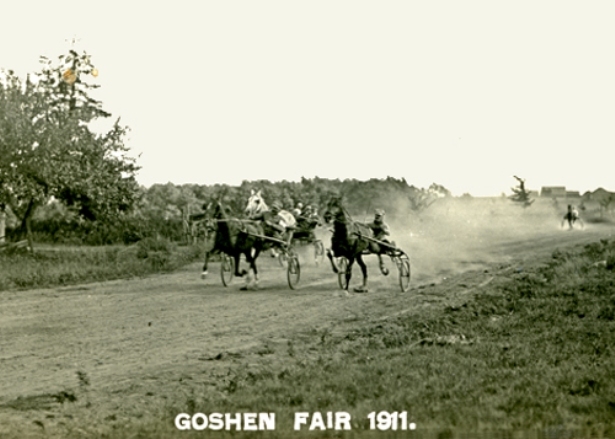 The first recognized fair in Goshen commenced on September 5, 1910. Its roots trace back to an annual Labor Day horse race that took place along modern Route 63 that runs next to the fairgrounds. The races, which local Goshen residents organized, soon evolved into a celebration of crop and livestock production and the agricultural way of life. Except for an interruption caused in 1942 and 1943 by World War II, the local agricultural fair was an annual tradition in Goshen throughout the 20th century. In 1952, thanks to record attendance during the postwar boom, organizers expanded the fair into a three-day event. In addition to crop and livestock competitions held during the latter-half of the 20th century, contests also existed for wood chopping, crochet, and even Hartford Election Cake. In the mid-1980s, members of the Connecticut State Grange awarded Goshen the Connecticut Agricultural Fair. Arguably the most important agricultural fair in the state, members and granges of the Connecticut State Grange started the Connecticut Agricultural Fair in 1967. Prior to arriving in Goshen the fair had been hosted in Durham, but the fairgrounds in Goshen in the scenic foothills of the Berkshires proved an irresistible location to fair organizers. The Connecticut Agricultural Fair remained in Goshen until 2006, when the fair’s board of directors voted to discontinue operations. Despite the loss of the Connecticut Agricultural Fair, the local Goshen agricultural fair remains a staple of life in the area. In 2012, the town hosted the fair for the 100th time, offering such modern takes on fair entertainment as fireworks, an adult spelling bee, a skillet throwing contest, and a monster truck show. “Goshen Fair.” Goshen Agricultural Society, 2017. Link.